Surrey Satellite Technology Limited (SSTL) has restructured its business, forming two new business units to manage its activities. A telecommunications and navigation business unit will be run by John Paffett, who was responsible for Europe’s first Galileo navigation satellite, GIOVE-A and SSTL’s geostationary communications satellite program. 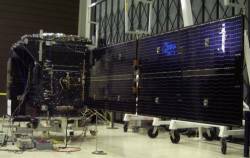 Earlier this month SSTL was awarded a contract with its partner OHB-System for the provision of 14 spacecraft for the European Galileo system. In the near future, SSTL will also begin work with the Telecommunications Regulation Authority of Sri Lanka for the development of a communications satellite and the formation of Sri Lanka’s space agency. The Earth Observation and Science business unit will be run by Paul Brooks, currently director of business development and sales and previously responsible for the Medium Wave Infrared and TopSat remote sensing missions. In the immediate future, SSTL is involved in a remote sensing mission for Kazakhstan and the launch of the NigeriaSat-2 and NX satellites later this year. The new business units will be responsible for the complete life cycle of missions.